The wind is howling outside, the waves are big, we’ve received over 40” of rain to date, the rivers are at monitor stage, (when are the herring going to run? ); and our thoughts are tuning to what lies ahead for this season. That depends! Groundfish: For Rockfish, we should have a promising season. Even though our black rockfish limit is down to three, the bag limit remains ten, but we are going to have 10 fathoms more added to our depth as well as longer seasons, to look for rockfish other than blacks. The rockfish season is from May 1 to December 31. As a bonus, we get one Canary to our bag limit and all depths for Nov-Dec, so that we can look offshsore for yellowtail rockfish and other mid-water fish. The caveat is that we need to avoid yelloweye (YE) rockfish areas, so we don’t impact them. We haven’t come even close for the last six years to the YE bycatch limit, but the 30 fathom allowance could change this. The Mendocino area remains at 20 fathoms for the same season dates due to YE concerns, but are also included with the all-depth for Nov-Dec months. While it took over three years to get this, (since they were mistakenly declared overfished), petrale sole can now be caught all depth all year, as are starry flounder! These little guys are VERY tasty and one of my personal favorites, as well as being fun to catch. While we drop our crab pots and let them soak, we can fish for petrale and/or sanddabs and check our pots every so often. All these changes in bag limit and season extensions took some five years or more and many discussions with the CDFW to make this all happen. While the lingcod limit dropped to two in the bag limit, cabezon, greenling and other minor nearshore species remain the same as last year. All in all, this should be a good year for the groundfish season. 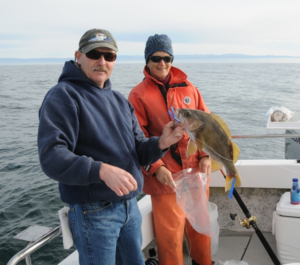 Charter Captain Tim Klassen and NMFS marine biologist Sue Sogard prepare to bag a female yellowtail rockfish. Yellowtail do not suffer the effects of barotrauma, this one came in 300 feet of water. Halibut: About eight of us from the local area went up to Victoria, BC for the Annual Halibut Meeting. The California contingent is very much appreciated by the 12 Treaty Tribes in the Washington area. Additionally, Oregon and Washington each had one recreation angler attend. Coastside also had a representative, Jeff Richards, replacing Dan Wolford, to sit on the Conference Board meeting. The stats can be confusing and worrisome. Last year our 2A survey went up by 146%, and thus we got 1.02 M lbs of apportionment overall (2.87% of the total). The Tribes pressed the Conservation issue and we ended up with 1.14 M lbs allowing us 25,240 lbs. While the process remained basically the same, this year the numbers dramatically changed. The survey dropped by only 5% in 2016, but the Commercial Weight Per Unit Effort (WPUE) dropped a whopping 47% (due to rough weather and tough conditions). The Commercial guys got their allocation, but it took much more effort and about three days, instead of the customary two days. The Tribes got all their fish in 39 hours (plus an overage of 70,000 lbs) so fishing was fast and furious. Due to rough weather conditions, all three Pacific States took a while to get their Recreational Allocations. However, for Numbers of Fish per unit effort (NPUE) in the survey, 2A actually went up by 1%, meaning more smaller fish were caught (primarily in the northern Washington area). So what does all this mean? The IPHC Staff pulled a new stat out of their bag of tricks and presented a new model this year. They have included in the Harvest Control Policy a “smoothing function” called a Time-Space Model. How it works is it predicts what density of halibut they think might be in those areas between the survey sites. In essence it makes a bunch of smaller density areas that add up to the Sectors total. This differs from the previous model that multiplied the entire Sector area with a density factor that was a weighted average of all the survey samples. So far so good! However, now they’ve added a Hook Competition Factor that further adjusts the observed weight landed in the survey. The 2A has been deemed a “low hook competition area”, as compared to the 3A Sector (Gulf of Alaska) that been deemed a “high hook competition area”. Here’s the rub, it’s based upon the numbers of baited hooks that come up after a 5-7 hour soak during the survey effort. Thus, the 2A area get a 15% cut in survey weight, while the 3A area gets a 65% increase in the survey weight! That is a substantial adjustment! As a result, our percentage of apportionment dropped from what would have been 2.64% down to 2.2%. As a result, the 1.02 million pounds of allocation from last year, dropped to 0.75 million pounds for this year. The 25% drop is due to both this Hook Competition and Smoothing Effort, combined with the survey up north improving as compared to the south areas. Bear in mind this knocks down our apportionment back to 2012 when we were at 2.1% prior to California being surveyed. This modification basically wipes out all the gains the California survey added to the 2A Area in 2015. The Tribes were very unimpressed (as was Canada) with this new method. 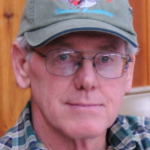 Since they have Government to Government Consultation Rights, they went into closed session with the Commission and hammered out that the 2A needs 1.33 M lbs so that they can have enough poundage to satisfy their Conservation Needs. We all benefit from their efforts, and they appreciated all our support by being there to support them. So, we get a small increase this year up to 34,580 lbs, instead of being cut back below 25,000 lbs. This is getting mostly political, and the science is getting very rubbery from my perspective. So, bottom line is, we will probably expect about the same season as last year. The extra 4,000 lbs might keep us fishing for another week or so. And, with the perceived cut-backs in the salmon season this year, we will need every fish we can get. So there you have it! I’ll try to scratch out another 1% from the GAP this year at the PFMC, but I don’t have much hope it will go anywhere. CDFW doesn’t support our getting additional allocation in California, but I’ll give it my best effort in spite of their lack of support…but it makes it tough. Did you know: While the Country was all absorbed with all the election hype last year, the Congress actually passed a Bill with bipartisan support that was very interesting! It is titled the Outdoor Recreation Jobs and Economic Impact Act of 2016. It requires the Department of Commerce to generate economic impact revenues as a portion of the GDP. It remains to be seen what this is used for, and whether the recreation community can leverage more attention and impact with the fishing Councils regarding allocations, seasons and harvest limits. Stay tuned!